Share "How Different Bird Feeders Attract Different Birds"
• Tray or Platform Feeder: Trays attract the widest variety of seed-eating feeder birds, such as starlings, house sparrows and native sparrows. Some have a roof to protect the seed from inclement weather. Screened or perforated bottoms prevent water from accumulating in the feeder and aids in keeping feed dry. • Window Feeders: Small plastic feeders attach to window glass with suction cups and attract finches, chickadees, titmice and some sparrows. These feeders allow a close-up view of the birds. • Hopper Feeder: This type is attractive to most feeder birds, such as finches, jays, cardinals, buntings, grosbeaks, sparrows, chickadees and titmice. The seed is protected fairly well against the weather; however, if the seed within the hopper gets wet, bacteria and fungus can thrive. This type of feeder tends to attract squirrels as well. • Tube Feeder: A popular choice that offers varied feeding holes that allow several birds to feed at once. Tube feeders attract smaller birds such as sparrows, grosbeaks, chickadees, titmice and finches. • Nyjer Feeder: These feeders come in two forms: fine mesh bags that birds cling to in order to extract the seed and tube feeders with small feeding ports. • Suet Feeder: Used to attract a variety of nuthatches, chickadees, titmice, jays, starlings and woodpeckers. 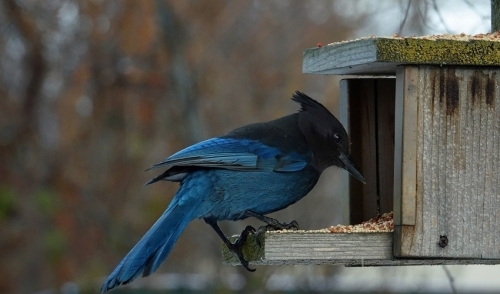 Offering a wide variety of strategically placed feeders in your yard will attract many species of wild birds for your enjoyment.